If your students are anything like my students, then they have a hard time following directions. So I created this funny little test on following directions. There are 30 tasks that they must do…but if they read correctly, then they really only have a couple of tasks to do. 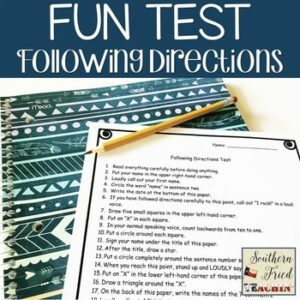 What happens in my classroom is that one or two students actually read and follow the directions correctly, while the rest of the students are doing funny things like yelling, “Old MacDonald had a farm” and standing up and turning around. The students who followed the directions are laughing hysterically at the other students. It is so much fun! It also really enforces the importance of following directions. Looking for more from me? Connect with me! You can also follow me on Pinterest, Facebook, Instagram, and my Blog.